Making my way down to the island of Shikoku, I change trains in Okayama, leaving the hyperfast shinkansen for a local Limited Express. Soon, we’re crossing a long bridge over the bay that separates Shikoku from the main island of Honshu. The day already considerably dug in the afternoon after the time I spend having brunch at my favorite sushiya in Osaka, close to Yoko’s place. The water glitters with the setting sun. Islands of various sizes, all covered in dense woods, scattered over the sea. In the distance, they are reduced to monochromatic shapes, like a minimalist ink painting. Boat silhouettes also dot the horizon, far away in the haze. Later, the sun slowly sets as I ride through the Shikoku countryside, amidst rice paddies and villages, until the train finds the coast again and follows it. Harbor cranes and industrial factories become mere shadows against the daylight weakening above the sea. It is dark when I finally meet Cara in Matsuyama. 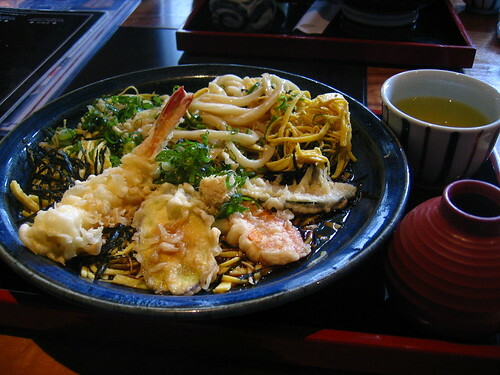 Over the next two days, I get a taste of the local specialties: we have a delicious cold udon, mine topped with nori and omelet stripes, various tempura and the usual salty sauce (tare); we attend the local matsuri (festival), “very calm” as an old man explains to us with a strong local accent; and finally, we relax in a nice onsen. 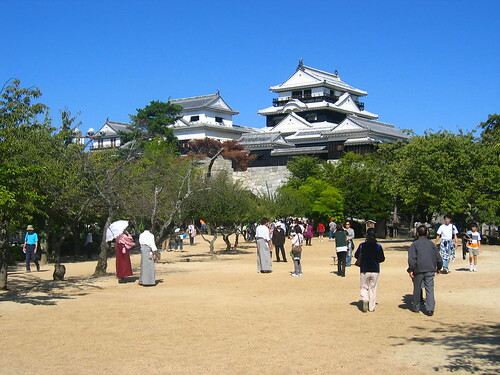 I also escape alone for a visit of the city of Matsuyama. First the castle, all wood and stone, beautifully intricate and planted on a hill in the middle of the city, from which you can oversee all the surroundings. 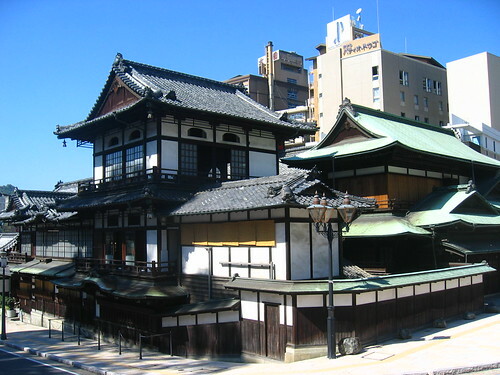 Then the famous Dogo onsen, a magnificent old wooden bath house hosting two pools, simple but authentic, in marble stone, wood and painted ceramic tiles. Unlike in Kyushu, the water is clear here, not sulfured. Many locals, young and old, come to clean, relax or chat, naked and at ease. Outside, a couple quietly parades in marvelous kimono. After which I give in to trying the local food specialties: some fresh senbei (shichimi flavor), delicious and crunchy, and baked mochi on a stick (nure okaki) served with free green tea. 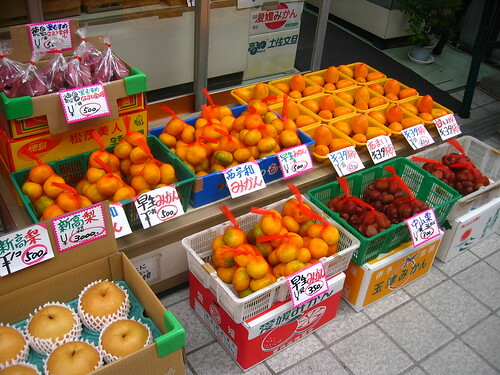 The day is warm and I refresh myself with juices from the local citrus fruits: mikan, which isn’t far from mandarin, only greener, and iyokan, somewhere between the acidity of lemon and the softness/thickness of mango. For dessert, a slice of taruto (tart), a roulade-like cake with red bean-mikan paste, and the tricolor botchan dango, three sweet balls on a stick (green tea, plain, red bean flavors). Quite the “full Matsuyama experience”. And indeed, while traveling in Japan, it becomes obvious how each region has established a well-known set of specialties. Not just a prominent monument and plastic statues of it, but a symbolic micro-culture that is strongly emphasized and, yes, sometimes exaggerated through the goodies (puppets, keitai straps, socks, etc) and souvenirs you can buy throughout the city. Which, of course, is highly convenient: when an area is so iconized in the Japanese subconscious, it becomes easy to refer to it and bring back the official specialties everyone knows about. The Japanese love to bring home gifts (omiyage) from their small trips. 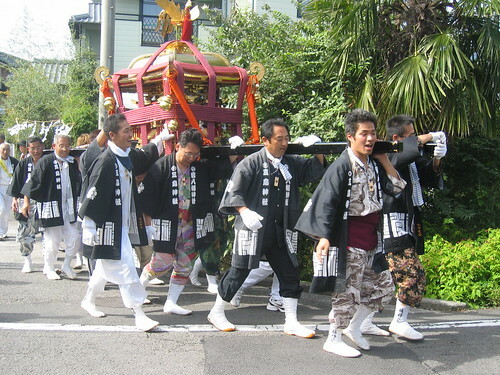 While the proliferation of related goods is clearly the product of Japan’s intense consumerism, I think the cultural institutionalization of local specialties reflects both the extreme pride the Japanese feel about the specific role they have been attributed and excel at, and their humility towards everything they admire others for. There is a genuine, almost childish excitement about exotic symbols, with a conscious blur between reality and fantasy: the tasty ramen in Fukuoka, the heavenly onsen in Beppu, the funny comedians in Osaka, the romantic cherry blossoms around the Himeji castle, the impossible coolness of Tokyo or, elsewhere but just as strong, the pastoral myth of Heidi in the Swiss Alps.